Amongst the kaleidoscope of national flags dotting Dhaka’s skyline in preparation for the World Cup, I’ve not seen a single Australian one. Not that it ever occurred to me to look—everyone knows that Australia is no football heavyweight. When one of my Bangladeshi friends politely asked whether Australia had qualified for the World Cup 2010, I was ashamed to admit that I didn’t know. But I’ve just checked on the internet: yes we did. In fact, Australia topped their group in the qualification round and was one of the first nations to qualify for the finals tournament without conceding a goal. But I still think that cricket will always be our thing. Although my interest in Australia’s performance in the World Cup 2010 has so far been lacklustre, in 2006 it was an entirely different story. The “Socceroos” were competing for the second time in the competition’s history and it was very exciting – even if we were the last team to qualify and the second-lowest ranked team. I was in Cambodia’s capital Phnom Penh at the time Australia was scheduled to play the mighty Croatians. My travel guidebook conveniently informed me that there was a sports bar across town that boasted a massive TV screen. Under normal circumstances I would not have had the faintest interest in going to a sports bar, but it was perfect for the occasion and I figured that other Aussies in town might have the same idea. So I set off in a tuk-tuk (CNG) just as the June evening rains set in. The monsoon was just beginning and I had been in Cambodia for just a few days, so I had no comprehension of how quickly the waters rise. In less than a quarter of an hour, the bottom of the tuk-tuk was submerged – at which point the driver turned off the engine and refused to take me any further. So I hopped out and started walking – or rather, wading. The water, which had reached waist level, was dark brown and full of debris. Pretty soon one of my rubber flip-flops broke, so I was forced to walk barefoot. It wasn’t the sharp objects under my feet that bothered me so much as the soft, squishy ones. Was it a dead rat, a baby’s nappy or perhaps some spoiled fruit I trod on? I don’t ever want to know. It was difficult to read my map as the streets were poorly lit, but after some frustrating backtracking and with the assistance of some rain-friendly locals, I eventually spotted the bar’s glowing neon sign and stumbled in. I was panting heavily and drenched from head to toe. I like to think I looked like a model patriot… All eyes turned to my bedraggled state – but why were there so few pairs of eyes? Where were my fellow Australians? A young man eyed me cautiously and I deliberately mistook that as an invitation to sit opposite him. “Are you here for the game?” I asked over the steady drip-drip from my clothes. I interpreted this to mean that he was finding my presence so offensive that he might leave within the next ten minutes. Although he probably did find me foul smelling, his answer was related to the fact that the match wasn’t due to begin for another two hours. I’d muddled my calculations of the time difference between Germany and Cambodia and thus I had walked through water for nothing. I ordered a beer and tried to feel grateful that I wasn’t two hours late. The match itself was pretty dull and riddled with inconsistencies by the referees – the result was a two-all draw. A few weeks later – long after Australia had been knocked out by Italy – I found myself playing an international football match in the most unlikely of places. I was on a tiny island called Don Det in Laos, which had no electricity, save for an hour a day. Spectating was therefore out of the question, but opportunities to play the beautiful game were rich. 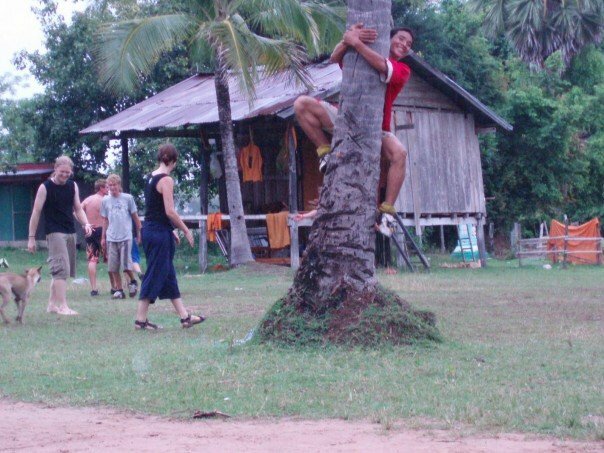 A rumour was circulating amongst backpackers that three members of Laos’ national football team were living on the island. So a group of us bicycled across a rickety bridge to a clearing containing a raggedy field and goal posts. And sure enough, a group of Laotian men in red and white uniforms had gathered under a palm tree to escape the light drizzle. They were wearing shin-guards and stretching. As I recall, the ratio of female to male players was 2:20 and to make things just that bit more challenging, I hadn’t exercised properly for two months. Anyhow, our motley group of nationalities and coloured t-shirts took up our positions as we made self-deprecating jokes. I was on the wing – my favourite position for hockey and football alike. 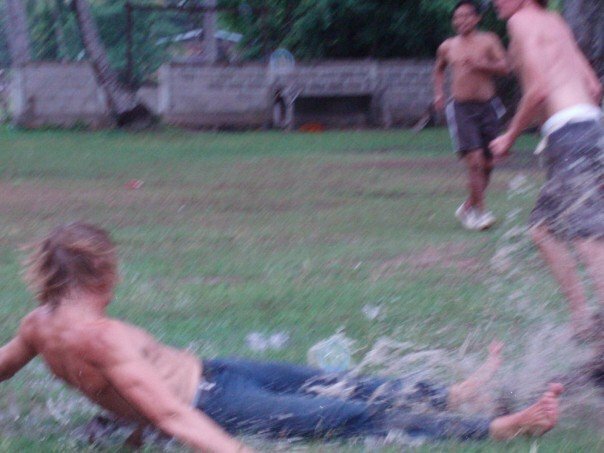 Within a few minutes after kick-off, the field had morphed into a mud pit. It was so slippery that it was difficult to maintain an upright position, let alone connect a foot with a ball. A couple of mangy dogs were sent off for interference, only to return at inopportune moments. Each time the Laotians scored a goal, one of them would leap up a nearby palm tree, whooping victoriously. Despite the fact that some of the backpackers were remarkably good players, we suffered an ignominious defeat. The score is too shameful to publish. Unlike many Bangladeshis, I can’t honestly say that I have World Cup fever this time around. I will enjoy watching a few matches, and I might even visit the Australian Club for the first time, so that I can cheer on the Socceroos. But what would truly excite me would be watching an African nation win the World Cup. I’m backing the whole continent.